Coy Hugh Johnston, 80, passed away peacefully on February 2, 2014, at his home in Mesa. Coy was born on May 29, 1933 in Bryce, AZ. He was preceded in death by his wife, Becky Johnston. Coy is survived by his children Diana Celeste, Rod (Cindy) Johnston, Coy (Tami) Johnston, Rick (Darla) Johnston, Velma (DaLane) Turner, Coleen (Joel) Shumway, and Cathy (Terry) Richardson, 41 grandchildren, 53 great-grandchildren and a brother LaVar Johnston and sister Verba Meteer. 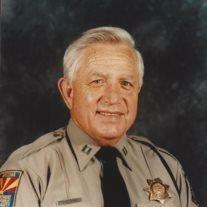 Coy served for fifty years with the Arizona Highway Patrol/Department of Public Safety. Visitation will be Thursday, February 6th from 6-8 PM at Bunker’s University Chapel, 3529 E University Dr., Mesa, AZ 85213. Services will be held Friday, February 7, 2014, at the Church of Jesus Christ of Latter-day Saints Mesa East Stake, 2228 E. Brown Road, Mesa, 85213. Visitation will be at 11:30 AM with the service starting at 1 PM. Arrangements were handled by Bunker’s Garden Chapel, 33 N. Centennial Way, Mesa, AZ 85213, telephone 480-696-6883.